While working on a project yesterday, my Dremel tool failed. I’ve had the thing for, well, so long I can’t remember, so it doesn’t owe me anything. But I was upset nonetheless because it has provided such great service over the years. More good news: I called Dremel and replacement parts are on the way. 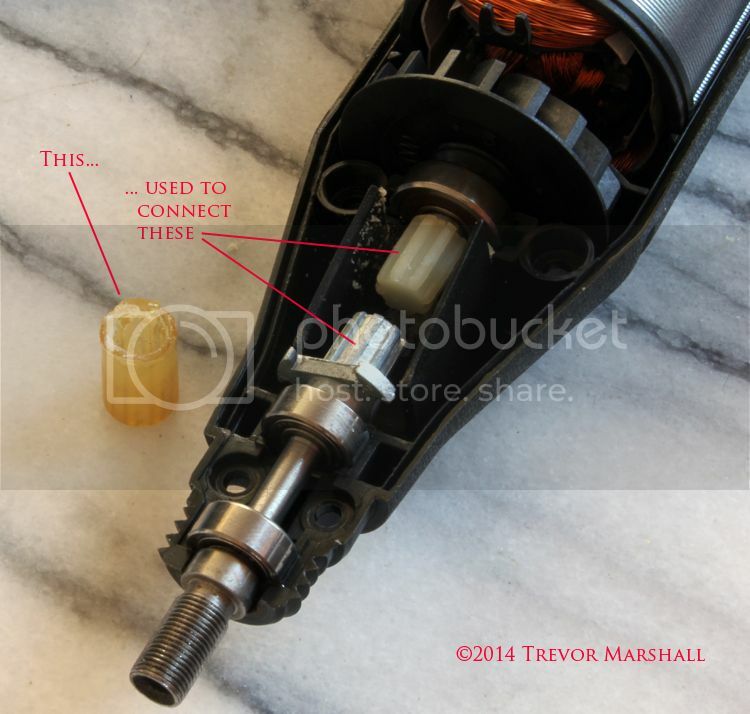 Service was excellent – thanks Dremel! And thanks, Chris, for pointing me in the right direction. 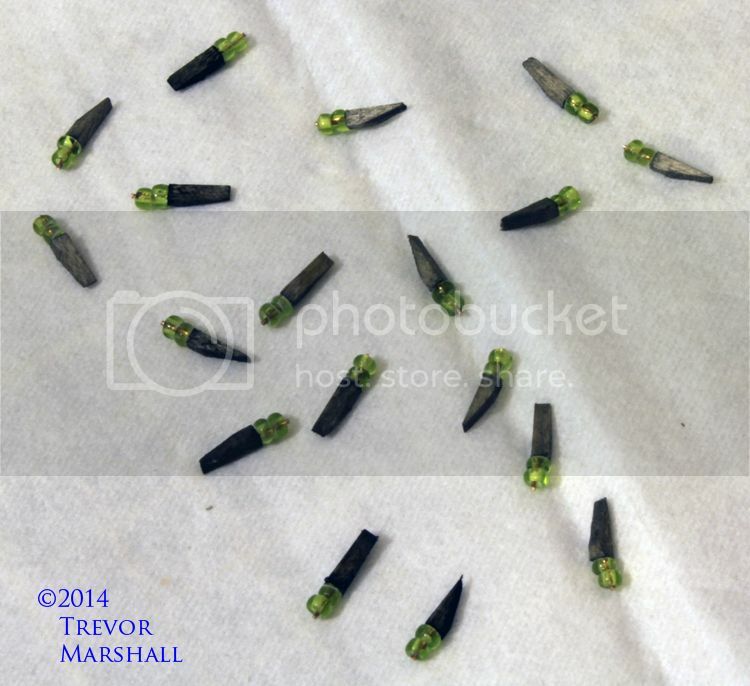 UPDATE (February 3, 2014): My replacement parts arrived today and it was a quick and easy fix. 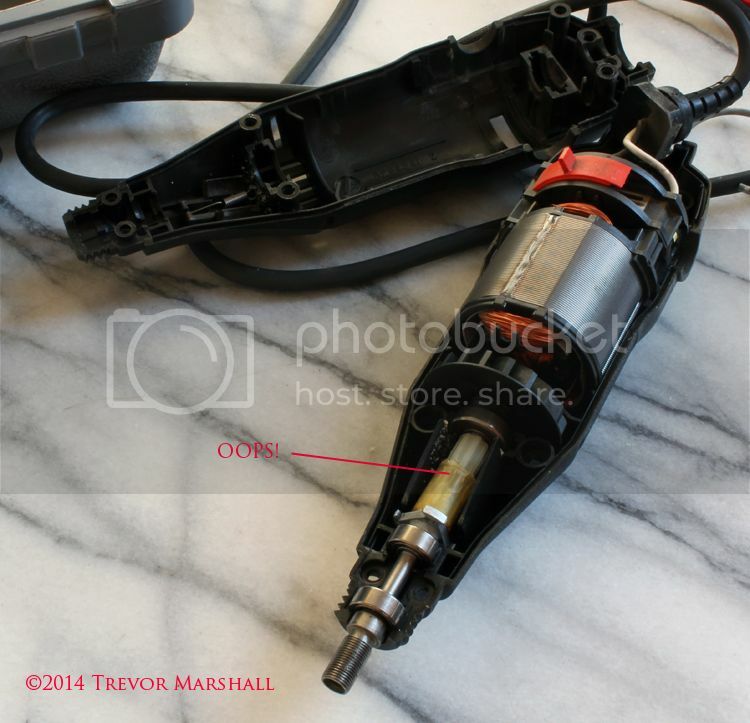 Thanks, Dremel – the tool is back in service! They’re small structures, but a lot of work. As I discovered while building Pierre’s models, there are a lot of fiddly little bits to add. So I took a break from building kilns, working on other things over the latter half of last year. But knowing that I have to build them at some point, I decided they’d be a good project for 2014. 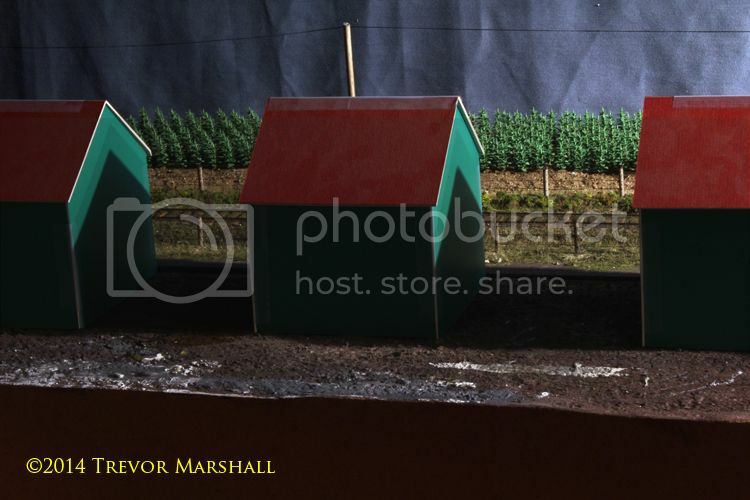 So this week I started working on five kilns in 1:64 to complete the scene in St. Williams. I’m following basically the same process I did to build Pierre’s kilns, although since S scale is considerably bigger and since I’ve already tried building them one way I plan to try some different things as I go along. So this won’t be a repeat of earlier postings. 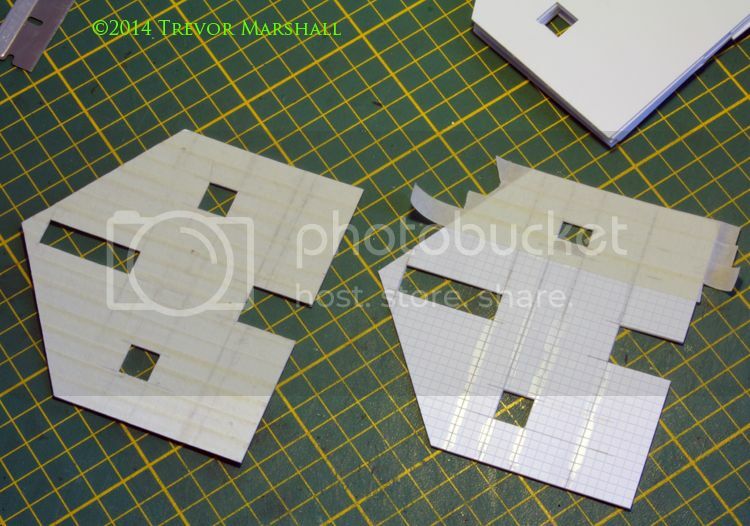 That said, I did start the same way: By cutting out the 10 end walls I’ll need from sheet styrene. 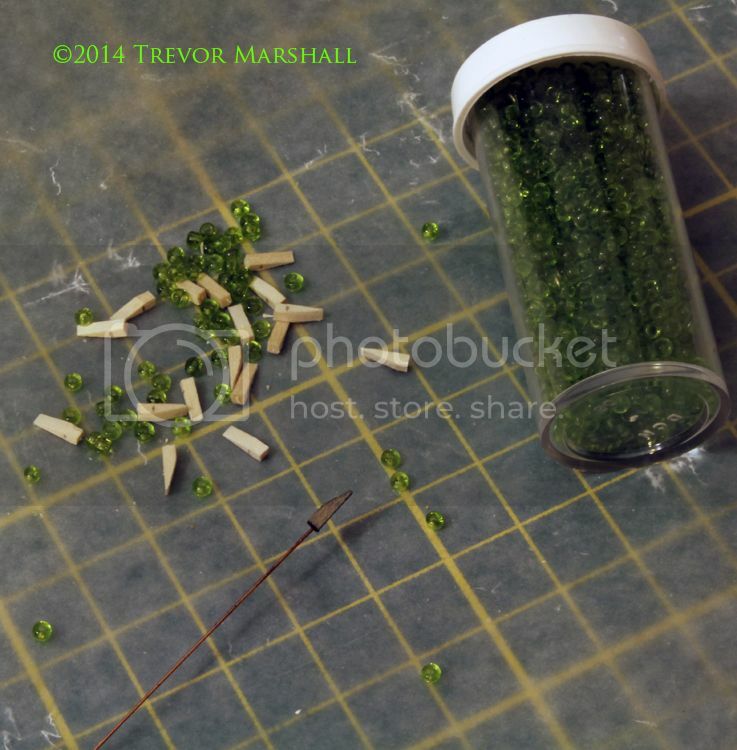 I used 0.040″ thick sheet since it’ll work nicely with the posts I plan to use in the corners. I didn’t have any 0.040″ thick sheet in stock at home, so I hit a local hobby shop. There, I found they had no plain 0.040″ thick sheet in stock. I bought some that’s marked off in tiles. It’ll work fine, and as I discovered it actually made laying out the walls a whole lot quicker since I could use the tiles as guides for cutting openings, and for cladding the walls with “tarpaper” (masking tape). In the above photo, the wall at left has been fully clad with tarpaper, while the wall at right is in process. Look at how easy those tiles make it to line up the strips! The stack of walls in the upper right includes front and rear walls. It’s not shown, but I’ve used a marker to write a unique identification on the back of each wall (e.g. : “5W” for “fifth kiln, west wall”). This will allow me to keep everything sorted as I progress. I worked from bottom up, strip by strip, so that paint would build up at joints between strips of tarpaper. The joints appear as darker lines. I also like the way this acrylic – applied straight from the tube – creates lighter and darker areas in streaks. I like the stained effect this gives the walls. As hobbyists, we’re naturally concerned about the future of our hobby. I regularly engage in conversations with people about whether the hobby will survive in the age of Smartphones, Multitasking, Social Networking (including writing and reading blogs), etc. The question is especially challenging for any hobby related to railroading, since real railroads no longer play the role they once did in people’s lives. That’s particularly true here in North America, where many people may go for days or weeks without seeing a train. Some argue that we need to get more of the Boomer generation interested in model trains. The argument is that Boomers are retiring and looking for something to fill the time. They have money and are old enough for trains to have a nostalgia factor. The argument continues by saying we can attract them by showing them easy to buy, ready to run equipment – and by taking the pain out of layout-building. Never mind the argument that Boomers will need something to fill their time – an argument that assumes they have no hobbies or other interests. The idea that we can attract retirees to the hobby by giving them an easy avenue of entry seems to me like a short-term solution to a long term problem. We’re exhausting our sources of oil that’s easy to pull out of the ground. Prices have already risen high enough that difficult oil – like the stuff that’s mixed with sand in northern Alberta – is now economically-viable to extract and process. Oil prices may fluctuate from month to month, but year over year they’ll continue to rise. Chinese labour costs are also going up. And factories are reassessing what they build – turning away difficult, precision work like model trains in favour of easier to assemble, more profitable consumer goods for China’s domestic market. It’s huge, it has buying power, and it wants stuff. When I do the math – when I realize that we’re all going to be paying more for essentials like food and shelter – I’m convinced that flogging ready to run fun at retirees will only work for the short term. Securing the future of the hobby for the longer term will require another approach. – Instead of selling the new hobbyist a dozen ready to run freight cars, we need to help them build and paint their first resin freight car. – Instead of selling the new hobbyist a ready to plant structure, we need to help them build their first structure kit – or a structure from scratch. – Instead of selling the new hobbyist ready to use snap track with integrated ballast profile, we need to help them learn how to hand lay their first turnout. The first bit of good news is, there are people out there who want to learn these skills. And they’re not just Boomers “looking for something to do when they retire”. They’re people of all ages. Look at the Maker Movement – in which people young and old are building stuff. Look at the emergence of Maker Spaces – community workshops where members get access to tools and space that they can’t afford at home, and the mentoring that they need to learn to use them successfully and safely. Look at the popularity of courses in making things – such as woodworking and jewelry – offered by community colleges and businesses that supply into these hobbies. As model railway enthusiasts, we need to identify potential new blood through our love of making things. We need to reach out to those in the Maker Movement, as well as those in other hobbies that are primarily about creating things – whether that’s a model-building hobby like armour or aircraft, or a craft like woodworking or metalworking, or an art such as painting or sculpture. But be warned: If we’re going to approach these potential recruits, we have to show them our very best stuff. It doesn’t have to be big: It does have to be great. I’m trying to do my part – in part by sharing what I’m working on through this blog and in part by introducing non-hobbyists I know (or those just starting out) to my layout. I’m particularly pleased that I’ve had some younger people over to run trains, as it has given me an opportunity to talk about the non-financial investments I’ve made in this layout – including researching the history of a small corner of Ontario … hand-laying track … scratch-building structures trees … crafting scenery … and figuring out how to faithfully re-create the roles of a train crew on a branch line mixed or way freight in the 1950s. The second bit of good news is, the model railway hobby will survive – regardless of what happens to the big manufacturers or major publications. 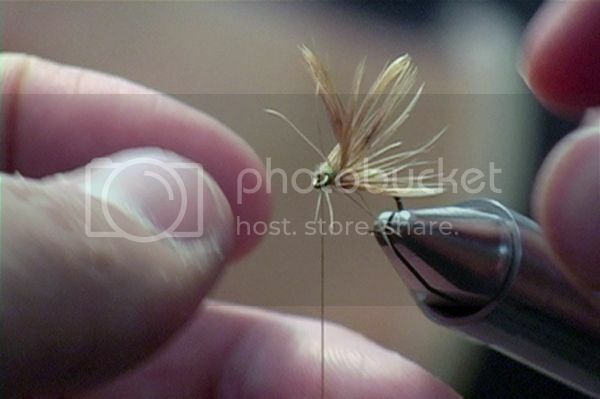 Granted, it will be a much smaller hobby. We will not win over new recruits by the thousands, the hundreds or even the dozens: We will win them one at a time. But it will be a much stronger hobby in some respects, too – because when we’ve won over those new recruits, one by one, they’ll embrace the hobby for life. Over on his blog, my friend Marty McGuirk has written an excellent post about clinic etiquette. I too have witnessed this problem – not only in clinics and other physical gatherings of hobbyists, but even in virtual gatherings such as the bull sessions that take place on some hobby podcasts. 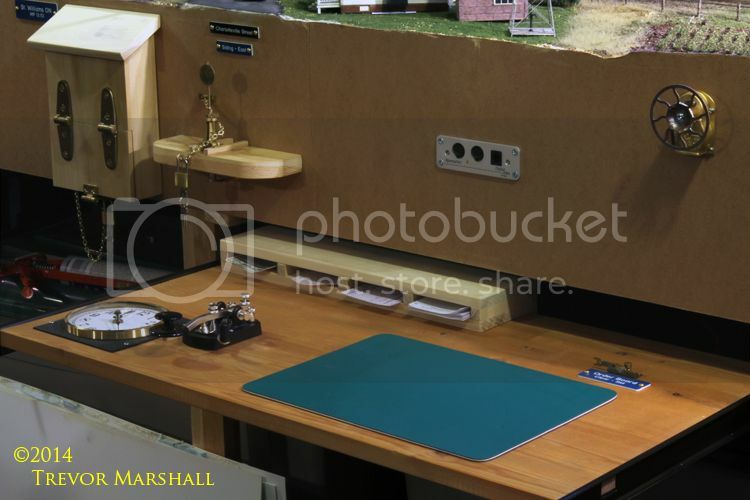 Marty’s post should be required reading for anybody attending a convention or other gathering where our fellow model railway enthusiasts put themselves in front of a crowd to share something about the hobby that they love. Attaboy, Marty! Yesterday, Hunter Hughson and I visited a 60-mile portion of the Wabash Buffalo Division that’s coming to life in Pierre Oliver‘s basement. Pierre’s layout is set in 1951 – so it’s a little earlier than the prototype photo at the top of this post, but the Wabash F7A units are signature locomotives on his line. The primary purpose of our visit was to start work on implementing the schedule used for the line. The segment of the Wabash that Pierre models is actually the Canadian National Railway’s Cayuga Sub. The Wabash had trackage rights over this line and in fact was the primary user. A while ago, Pierre visited my place with a copy of the Cayuga Sub schedule and we re-created it in a table in MS Word. This was a first step: We needed an electronic, editable copy that we could then modify to reflect reality as presented on Pierre’s layout. Hunter, Pierre and I did ran a train and recorded the time it took to travel between each station represented on his railroad. The entire run – from staging to staging – took about a half-hour, and if Pierre uses a 4:1 fast clock that will nicely translate to about two hours, which is approximately how long it took a Wabash Red Ball fast freight to cover the 60 miles of prototype line. With that knowledge in hand, I then started modifying a copy of our electronic time table, adjusting the scheduled times to reflect, in a 4:1 ratio, the actual travel times between modelled stations. We then printed out several copies and tried running a couple of trains to see what would happen. Much of the process of building a usable time table for a layout involves testing and revising. The idea is to start somewhere – anywhere – and see what conflicts arise and determine how they can be sorted, or even whether they should be sorted. 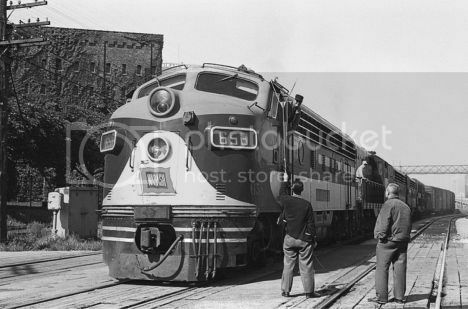 Hunter took the throttle on Wabash mixed train 356, Pierre commandeered Red Ball train number 82, and I boarded a westbound freight extra – one of several that Pierre will have to run, as the Wabash did, to balance traffic and motive power on the Buffalo Division. Given that we were experimenting, we decided to start the extra west at 8:00 am – in between the starting times of the two scheduled eastbound trains. Over all, things went very well for this first test of the time table. As with the prototype, Train 82 overtakes Train 356 at Aylmer and that went smoothly, although the wait time for 356 after 82 clears is pretty long. We might want to tighten that up a bit. This is the sort of knowledge that only be gained by putting one’s ideas to the test. 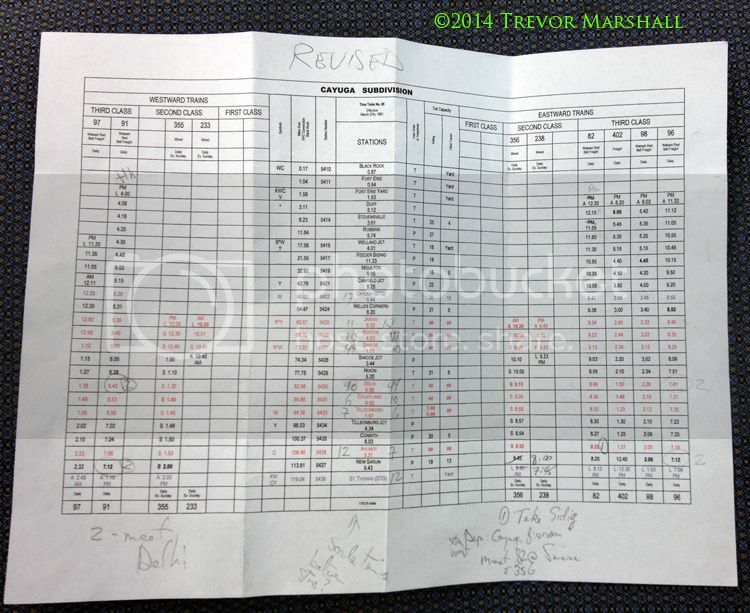 The time table has now been edited to incorporate these observations and sent back to Pierre, in preparation for the next test. I had a fair bit of time this weekend to think further about the perception held by many in the hobby that smaller, simpler layouts are something we build because we’re somehow reining in our hobby ambitions – that we’re “settling” for less and that we would all build larger, complex layouts if only we had the time, space, and funds available. I think this perception ignores the reality that many people – myself included – opt for a lifestyle in which our hobby plays a positive and supporting role, but it’s not the centre of our universe. Here’s how the hobby fits into my life, and why a smaller, simpler layout is a choice – not something that represents a thwarted ambition. I live in Toronto – right in the downtown. Given the year in municipal politics that we’ve just endured, I’m sure everybody has heard of the city by now. But if you haven’t, it’s the fourth largest city in North America and one of the most diverse places anywhere on the planet. 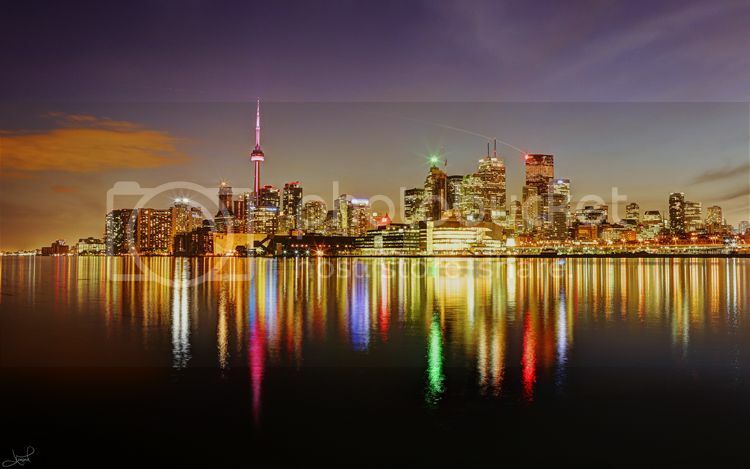 Toronto has a vibrant cultural and social scene – whether it’s restaurants, music, art, theatre, sports, festivals, or any other criteria you care to use. It’s no surprise that we also have really, really expensive real estate. It’s not expensive like New York, London, or Paris – but for model railway enthusiasts, anywhere on the planet, living in the heart of a metropolis means acquiring space for a layout does not come cheap. One answer for hobbyists who want a bigger train room is to move to the suburbs or to small towns. In fact, many people do choose their living arrangements based on the needs of their hobby – we’ve all read their stories in the hobby press. We love doing it – so much so, that we even considered moving to the country so I could be closer to the place where we train. I even worked out that the gas I would save each week would pay for a third lesson. 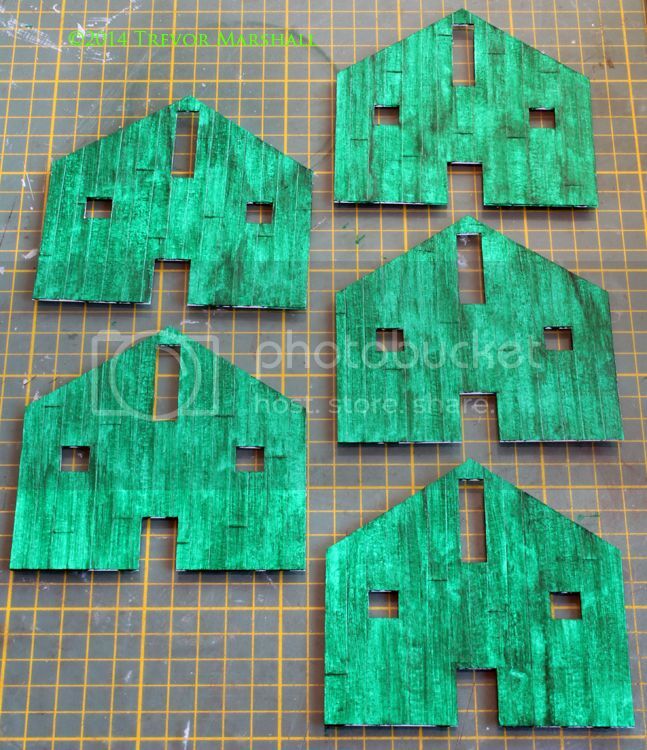 And with real estate more affordable in the country, I could have a larger layout room, too. I enjoy the energy and opportunities that come with living in the heart of a big city. I love that my wife can walk to work from our house. (She works long hours as it is: If she had to commute from the country I wouldn’t see her at all.) I love being able to walk to shop for almost anything: I have an awesome store in my neighbourhood for music, an electronics surplus shop with an amazing supply of widgets, several great new and used bookstores, a wonderful tailor, and an abundance of fantastic places to eat and drink – something that regular readers know from the various dinner reports I’ve shared. I love that almost every store that does not sell food welcomes my dogs – and many keep a supply of cookies for their four-legged customers. If it means that my layout room is in a modest space, in a narrow basement with ductwork that presents vertical clearance issues that preclude double-decking a layout… well, that’s all part of life in the big city. It’s all part of a choice I’ve made about where – and how – I want to live. I’m not “settling” for a smaller layout until I can acquire the space for a larger one: My wife and I could sell our house tomorrow and buy that big train room in the country. But it’s not a price I’m willing to pay. And I’m happy for people who do make that choice. We all have different priorities. I’m not advocating in this post – or on my blog – that my choices are the best approach for all hobbyists: Just the best choices for me. And I am advocating that others in the hobby – particularly those better-known modellers who have some influence – also recognize that their personal choices do not translate into trends or best practices that everyone should embrace. I’ve written about this before, but it’s worth repeating. Simple layouts – such as mine – can be very rewarding. We get so worried that our layouts will not be interesting enough when they’re built that we tend to make them overly complex. A couple of recent developments reminded me of this. Lance makes some really good points to explain why these three factors often lead to layout failure. And I agree, 100 percent. These are lessons I’ve learned from my own, previous layout-building experience, and from watching many hobbyists grow disenchanted with their large, complex, difficult to build/maintain layouts. In his post, Lance suggests that hobbyists engage in a design exercise to put one in the mindset of simplifying their plans. I won’t rob him of visitor traffic by explaining what it is – you’ll just have to read his blog to find out more. But I am curiously pleased to discover that if I were to take up his challenge, I would actually have to double the complexity of my layout. Thanks, Lance, for another thought-provoking read. I appreciate what the author was trying to say: If you’re short of hobby time or disposable income, you might want to rethink modelling the Northeast Corridor, Horseshoe Curve, or Toronto Union Station in favour of something more modest. But while layouts based on branch lines do offer a choice to those with limited time or money, describing them as such suggests (to my mind, anyway) that those who choose to model a branch line are somehow “settling for less” – that if we had more resources, we’d focus on a larger, more complex prototype. – If the layout only needs one or two locomotives, the enthusiast can invest more into each. – If the layout needs only a dozen or so structures, each can be carefully detailed to a higher degree than on layouts that need a couple hundred. 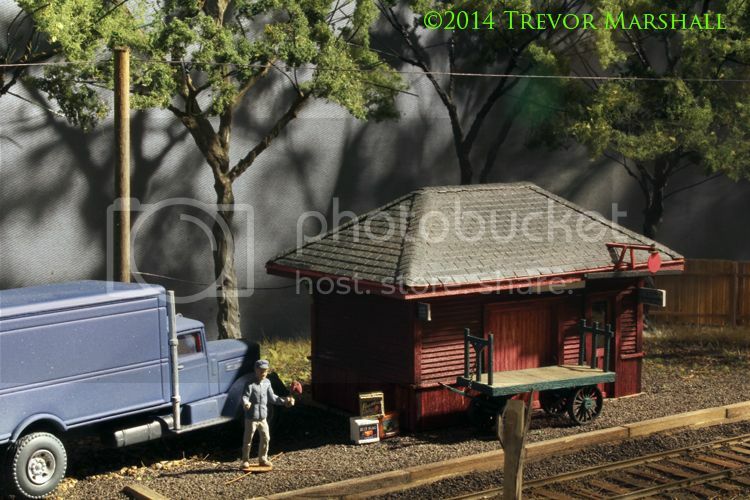 I did not choose to model the Port Rowan branch because of either a lack of hobby time or available coin. Rather, I wanted to enjoy building each element of my layout without worrying about how many dozen more of something I needed to realize my vision. I’m a process modeller: I like to figure out how to do something once. I’m less interested in doing it five or six times. This is one reason why I’m unlikely to model a subject that requires big blocks of identical cars – whether that’s coal hoppers, intermodal equipment, or commuter coaches. I understand the appeal of this type of prototype – moving lots and lots and lots of the same thing is part of the economic argument for building a railway in the first place. And I admire the perseverance of those who can build two dozen identical kits, assembly line fashion. But I know I can’t do that, and don’t want to. I also know that as I get into a project I look for opportunities to add details. I’m particularly susceptible to this when it comes to structures. It’s not about detailing but about understanding – and properly representing – the construction of a prototype and how to model it. I engage with this hobby in part because I like to learn about the world around me, and learning how a building’s intended function influences its design is something I find fascinating. The five tobacco kilns I plan to add to St. Williams are a good example of this. A couple of summers ago, I went on a field trip to measure and photograph the prototypes. When I did, I was fortunate to find one with a wall that was partially missing, allowing me an opportunity to photograph the interior. I’m currently debating whether to model all five kilns as shells with closed loading hatches, or do one with open hatches and a full interior… or do all five with full interiors. Doing the full treatment on a single kiln will require a lot of hobby time – probably more time than it would to build all five as shells. I’m more likely to enjoy the prospect of this if I don’t have to build a couple hundred structures for a layout. And we won’t even talk about the number of trees I’m building from scratch. I also chose to model a branch line so that I could do it in a larger scale than HO, because I wanted to work on what my friend Chris Abbott has coined “larger models of smaller prototypes”. 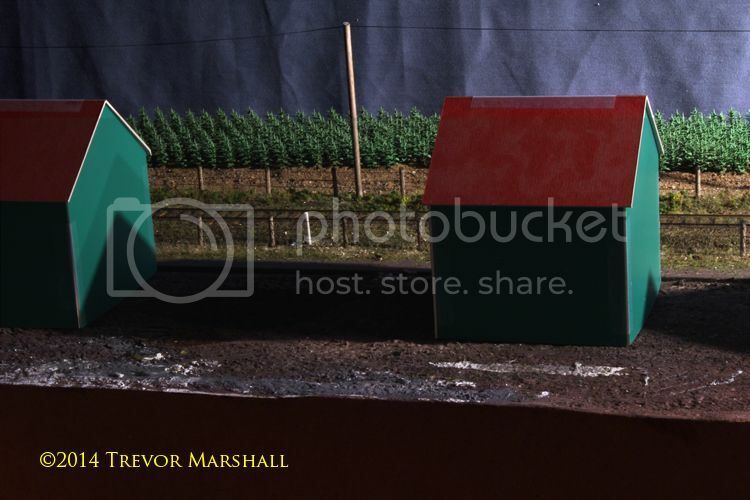 I’m working in S right now, but have previously worked in O scale in my layout space. 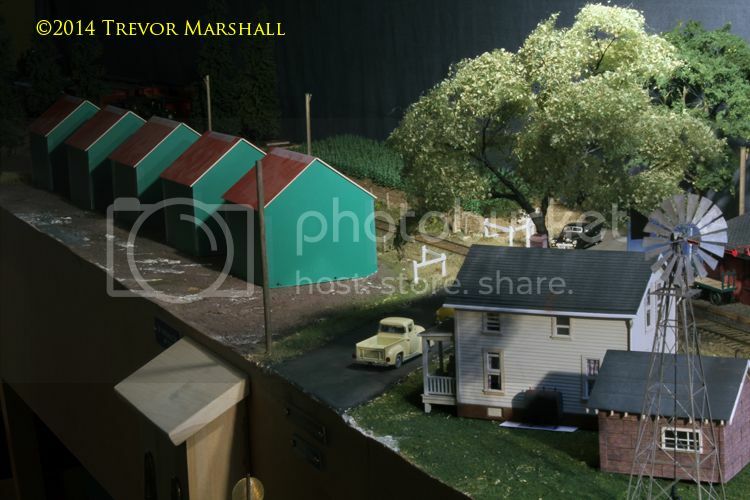 I could have opted to build a more complex layout in HO in my layout room – or an N scale layout worthy of a club effort. But that’s not what I wanted. In fact as I’ve said previously on this blog, if I had 50 percent more space than I do, I’d build the same layout but with larger radius curves and more open-country running between St. Williams and the staging area. Rather than consider simple layouts and branch line themes as our second choices – rather than revere the massive and the complex – how about celebrating the opportunities for craftsmanship that such layouts offer? My friend Mike Cougill has written about what he calls a Freedom Layout. It’s a great term: A very positive way of looking at simple layout designs – regardless of the space, time and money one has for the hobby. As I interpret it, a Freedom Layout is not about settling for less – but about deciding what we actually need to enjoy the hobby, and ignoring the rest. 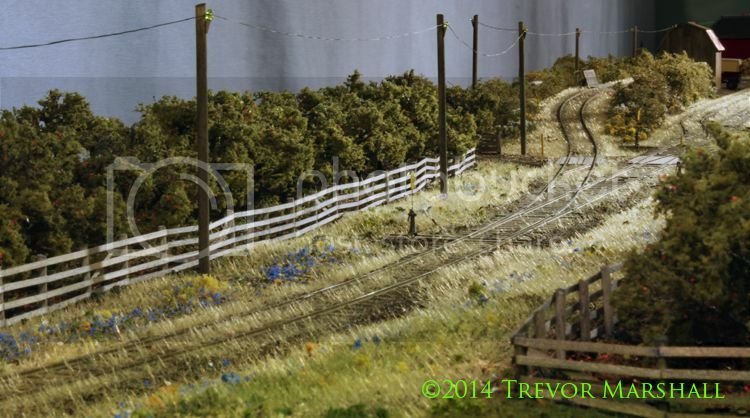 Yesterday I built insulators and added wire to the telegraph poles that line the railway right of way. Depending on era, the Port Rowan branch had a single wire telegraph line or a two-wire telephone line. I chose the single wire because I haven’t seen it modelled as often as more traditional pole lines. I located the telegraph line based on prototype photographs and was pleased that it I could run it on the backdrop-size of the tracks through Port Rowan and St. Williams, as this would keep the telegraph line out of the way for operators – a particularly important consideration for me, since I like to wear cufflinks which would surely snag in a telegraph line! I used EZ Line – the same stuff I used for the right of way fences through St. Williams – although for the telegraph line I was careful to not tension the EZ Line as I wanted it to arc from pole to pole. It was tricky to do, and the amount of drape varies between each pair of poles, but I like the effect regardless. I did this because I needed to get the telegraph line past the Lynn Valley water tank. As the above photo shows, the tank is located on the far side of the tracks from operators and is surrounded by trees. On the prototype, the telegraph ran on short poles across the track from the tank, which would place them on the aisle side on my layout. But that’s okay, because there’s no need to reach into the layout through the Lynn Valley during the course of an operating session. I installed the telegraph poles ages ago, but deferred on adding insulators while I searched for a suitable source. In the end, I built my own. 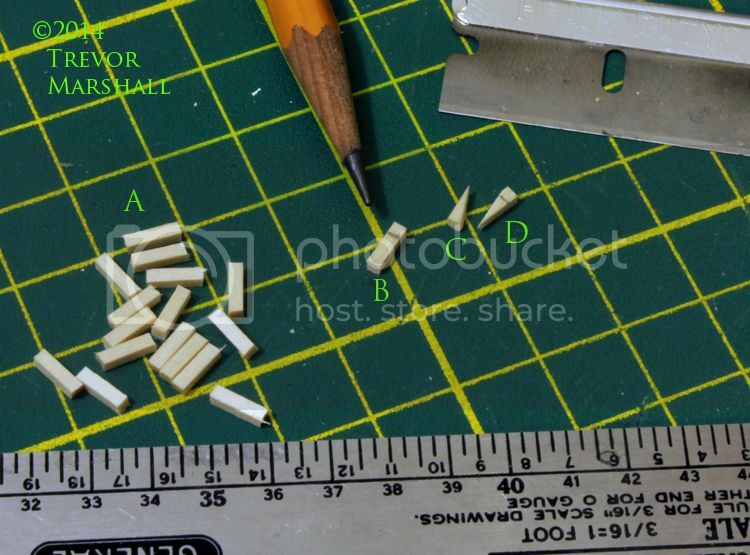 I used scale 4″x4″ and cut a bunch of pieces a scale 16″ long (or, 1/4″ in our 1:1 world), as shown at “A”. I measured 4″ from one end and marked each bracket with a pencil (“B”), then cut the strip wood at an angle from pencil to end. Discard the scrap (“C”) and lightly sand the cut edge if required, and voila: a bracket (“D”). I finished each insulator one at a time. 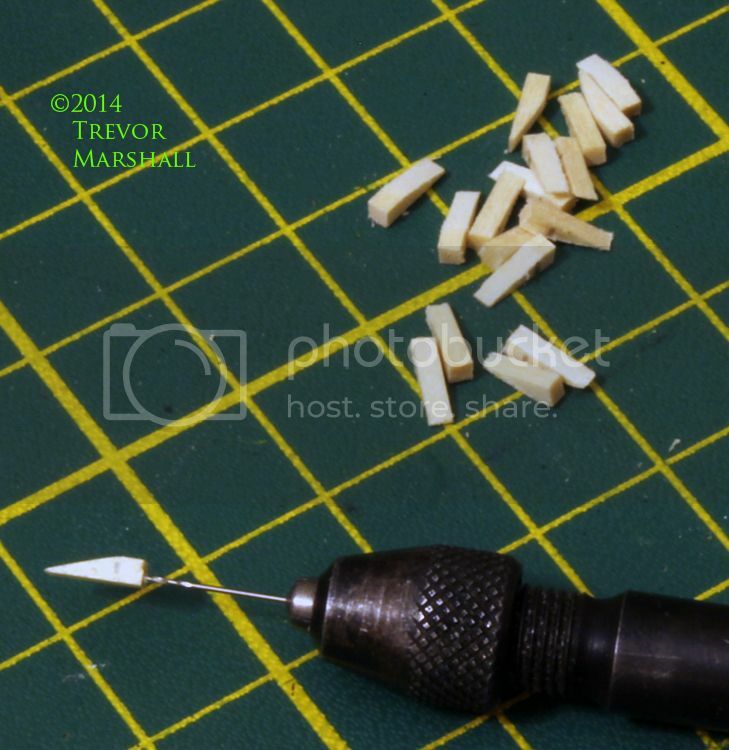 I stuck a length of .015″ wire into the hole I just drilled – but did not yet cut it. I used the wire as a handle to dip the bracket into some stain. With the bracket stained, I added a drop of thick CA to the point where the wire and bracket meet to glue the two pieces together. The finished insulators and brackets are glued to the telegraph poles with thick CA – with the angled side of the bracket joined to the pole so the insulator sticks out at a slight angle as shown in the layout photos. I will admit they are a bit on the large side because I couldn’t find any smaller beads for the glass insulators – and my source had a lot of beads from which to choose. But I’m happy with the result: As the layout photos above illustrate, the insulators catch the light nicely and if I’m going to scratch-build little details like this, I’d like them to be big enough for people to see.